1 November 2017 – LONDON, UK: AI and networking pioneer Aria Networks is showing how the combination of software-defined networking (SDN) and AI can be used to create a self-healing network. In a demonstration on show at LightReading’s “OSS in the Era of SDN and NFV” event, Aria shows how a 4K video service overcomes network congestion by using AI to dynamically reroute the service, across a virtualized network. The showcase incorporates the use of an SDN controller based on OpenDaylight – the industry’s leading opensource SDN controller development platform, run under the auspices of the Linux Foundation. To demonstrate the solution, Aria uses the Mininet network emulator to create a node of virtual switches. This creates a virtual software-defined network (SDN) that the OpenDaylight (ODL) controller can then be used to control. 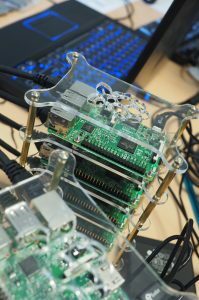 The software runs on virtual machines deployed on a network of Raspberry Pi computers. OpenDaylight is the foundation of many commercial SDN controllers, including Cisco’s Open SDN Controller (OSC) and offerings from Extreme Networks, Inocybe, Lumina (ex Brocade). According to the Linux Foundation, OpenDaylight-based controllers support the services of over one billion internet users today.